If buying a ticket to a Tyler Perry movie seems as enjoyable as a root canal, Tyler Perry's Madea's Big Happy Family makes a brilliant case for nitrous oxide. The latest installment in Perry's flagship franchise marks the return of his monstrous matriarch, now presiding over a troubled family trying to come to terms with an impending death. Business should be brisk for the Big Happy Family and Lionsgate should expect strong legs once it hits DVD. 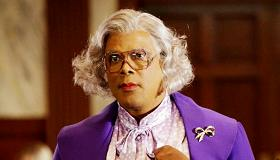 As ever, Perry plays Madea, a feisty septuagenarian who springs into action—literally—when her family is in trouble. This installment's ruckus revolves around Madea's niece Shirley (Loretta Devine), who struggles to summon her bickering children together so she can deliver the news that she has terminal cancer. Shirley's daughters Kim (Shannon Kane) and Tammy (Natalie Desselle) squawk incessantly; their hen-pecked husbands, scrappy Harold (Rodney Perry) and accomplished but exasperated Calvin (Isaiah Mustafa, aka the Old Spice Guy), commiserate with their wives' younger brother Byron (Bow Wow), who's having his own problems with his baby mama (Teyana Taylor) and current squeeze Renee (Lauren London). But when these simmering conflicts threaten to turn explosive, Madea is forced to intervene and try to reunite Shirley's fractured family by any means necessary. Some argue that these characters embody unflattering ethnic stereotypes or are simply all-purpose clichés, but Madea's Big Happy Family counters that the reason filmmakers fall back on familiar conventions is because they usually work. The characters are little more than ciphers for different sorts of personalities that produce boilerplate drama - Perry gives them no more substance than the sum total of their problems presented by the plot - but behind their bad behavior, he gives them a credible explanation, if not an excuse. For the majority of the film, almost all of the female characters are shrewish, demanding and oppressive, but Perry gives them dignity, and moreover, depth by offering motivations for their actions-those, too, qualify as clichés, but somehow they still make an impact. Meanwhile, the sharp pitch of both the film's comedy and its melodrama has viewers yo-yoing from one emotional peak to the next, but Perry handles this sort of storytelling expertly, even though several of his central characters would be conspicuous even in those Mexican soap operas where adult men play overgrown children. Madea herself is a force of nature, the sort of creature whose reactions you both anticipate and fear, and Perry gives a virtuoso performance-he's smartly judicious about when to unleash her and when to hold her in the wings. Because the comedy bits largely exist as autonomous sequences, they offer a welcome interruption from the film's searing drama (it starts with Devine discovering that she's dying and gets even more intense), giving the overall experience an unexpected balance. Still, there's no denying that Perry's oeuvre has a cultural specificity that hasn't won over some viewers, who are half-right when they think it offers little more than the mainstream iterations they find equally unappealing - think Martin Lawrence and Eddie Murphy's fat-suited escapades. If nothing else, Perry demands a tolerance for characters and situations that are broadly rendered, even if intentionally so. But for a film series that's been subjected to constant scrutiny - as much because of its absence of interest in critical attention as any actual criticism - Perry's big breadwinner is also big on laughs, and those laughs aren't limited in their effectiveness to those who've already drunk Madea's Kool-Aid. Of course, Perry doesn't need to bring in new audiences-he's already made a mint off of connecting with his faithful. Yet it's precisely because his big, broad, but grounded characters connect to your life, and that their problems don't seem like such a far cry from yours, that Madea's Big Happy Family is so satisfying and surprisingly fun.